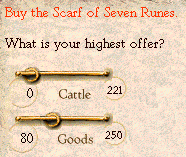 For what it's worth, the game seems to have specifically kept track of how many heroquests we've done since tribe formation. If the ones between tribe formation and becoming king didn't matter, it'd be kind of silly to reset the counter once we form a tribe. Our heroquests are now 35% more fashionable. 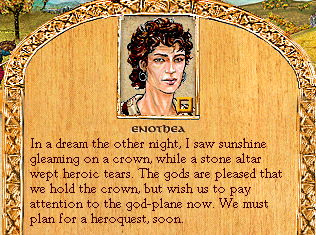 The game provides a none-too-subtle hint that heroquesting is important to proceed from kingship to the endgame. 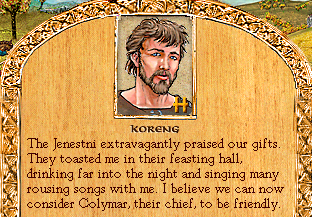 Koreng comes back with good news. 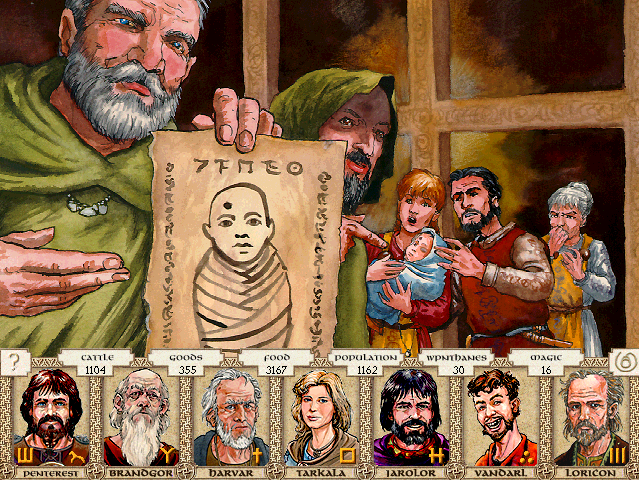 Priests and thanes from the Brown Boar clan come to request the right to adopt Voballa, the young child of carls Vanartha and Robasart. "A document written during the First Age says that a great hero of the Knowing God will be born one day in Dragon Pass, and that she will have a mark upon her forehead, like so. This babe has the same mark upon its forehead. We ask that you allow us to raise the child, as we are uniquely qualified to initiate her into the secrets of Lhankor Mhy." -Grant their request, in exchange for a gift of knowledge. -Grant their request, in exchange for a gift of magic. -Let them raise her, but not as a member of their clan. If we grant their request, they will like us better. Of course we must grant this request. Our magic is already strong. We should ask for knowledge that we can use when we heroquest. Varnartha and Robasart will be sad to lose their child, even to a heroic destiny. This will end in sorrow for Voballa. Hey, if I'd known about this prophecy, I could have made them a baby with that mark a long time ago! Varnartha and Robasart will be sad to lose their child, but the carls will understand the importance of Voballa's heroic destiny.